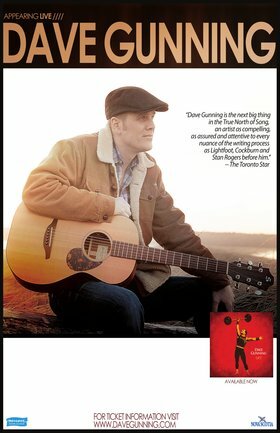 We are pleased to bring back to Victoria audiences Nova Scotia's Dave Gunning! Dave is master story-teller, gifted songwriter, a wonderful singer and entertainer! There are stories that wash over you like a tide, and then there are stories that grab you by the heart. Dave Gunning has made a point of finding the latter and wrapping them up in song since he broke upon the East Coast music scene in Canada back in 1997. The Pictou County, Nova Scotia born and bred singer-songwriter and working class hero has built up from humble beginnings to a point where his name is regularly included in conversation with artists such as David Francey, James Keelaghan, Ron Hynes, Stan Rogers, Bruce Cockburn and Gordon Lightfoot. 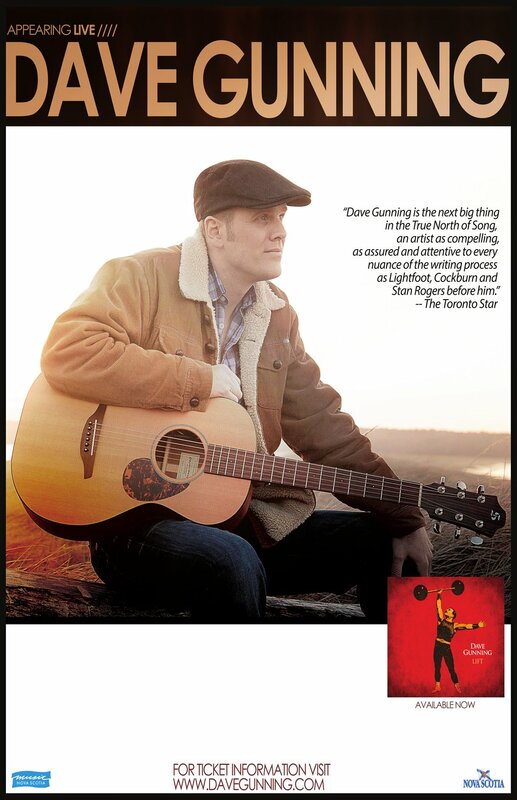 Writing from a sonic menu that includes flavours of Irish, Scottish, French Acadian, folk and country musical styles, Dave Gunning transcends genre with songs that fill your senses and touch your soul. Dave was a painfully shy teenager who might never have gotten on stage if it weren’t for his junior high best friend JD Fortune (INXS). Fortune signed the two up for a variety concert where the sound man was none other than country singer/songwriter George Canyon (Nashville Star 2). Gunning backed Fortune on guitar for “La Bamba” before taking the mic for a Buddy Holly cover. Little did anyone know that in that room in a small East Coast school were three future stars. Fortune has shone brightest thus far, and Canyon isn’t far behind. But thirty years from now it seems likely that Dave Gunning will outshine them all. While names like Francey, Keelaghan, Hynes and even Rogers might not mean a great deal to American audiences, together with Gordon Lightfoot and Bruce Cockburn they are iconic across Canada. Parallels in the United States might include James Taylor, Bob Dylan, Bruce Springsteen, Randy Newman or Lyle Lovett. Dave Gunning is that sort of songwriter; one who creates images and moments in song that are palpable. Quiet and reserved otherwise, Gunning takes on an almost Garrison Keillor-type storyteller persona on stage, injecting stories between songs that run the range from sweet and touching to uproariously funny. If you’re lucky enough to catch a Dave Gunning show, perhaps he’ll tell you the one about getting beaten up by a dentist as a toddler. You can’t make stuff like this up. Dave paid his dues supporting other artists over the years, touring with the likes of Stompin’ Tom Connors, JP Cormier, John Allen Cameron, Ron Hynes and Stephen Fearing. Since heading out on his own, Gunning has continually stood out in the crowd. Dave has been awarded six East Coast Music Awards out of fifteen nominations since 2003 and took home two 2011 ECMA awards for his recording, … a tribute to John Allan Cameron. Gunning has also been a finalist in the Great American Song Contest, the USA Songwriting Competition, the John Lennon Songwriting Contest and the International Songwriting Contest. All of the hardware and certificates aside, however, it is the personal connection that Gunning’s music engenders that is the greatest testament to his craft.